we had been invited to gather stones for the closing fire, and as we gathered round the fire that evening, gathering ourselves and each other in, gathering moments of grace, the stones would be used as ‘talking stones’. earlier that evening, as i visited the point where we had howled for the wolves, the stone had appeared for me, half buried in the side of the bank, not fully emerged, but its rounded contours revealed just enough that i recognized her. she slipped easily from the sandy soil into my hands. yes, this was the one. i’d had the thought that we might create a cairn of sorts with our stones, to honor the place as sacred, as a marker of something meaningful on the journey, the way in which our ancestors might have for those who followed after. i recalled the men’s and women’s sacred spaces at the columcille and the way the paths to those places were lined with mini cairns, marking the way, by the many who had walked there before me…how holy that ground felt beneath my feet. i then learned from marti that the arctic peoples created ‘inukshuk’, stackings of stones made in the image of a human being. it was thought that these inukshuk may have marked places where food, shelter, or safe passage had been found. Food. Shelter. Safe passage. Yes. i remembered a story told by rabbi shapiro about how the hebrew name of God, the 4-letter name Y-H-V-H, when written vertically takes on the shape of a human being, how it is that we are literally to be the name of God manifest. all week long the sense of incarnation was so palpable around us, the sacred enfleshed, expressing itself in beauty. now we were gathered again by the fire with our stones, all of this swirling. i didn’t know where it was going. i suppose you could say i was ‘winging’ it, catching the current, letting it take us. as each person held and beheld his or her ‘stone’, which had become something more in the sharing, we began slowly to speak. what nourishment had been discovered? what shelter offered? what passageway marked? what was needing to be named as sacred? to be marked as beloved, as a place of spirit? the stone i had chosen lay in my lap. she had become the mother stone. rounded, pregnant in shape. she represented the sacred gift i had been given that week, and named in my dream of the previous night when ‘wise woman/crone’ came to my sleep with her reassurance that the ‘seed had been planted’, to not give up hope. she disclosed to me that she, too, had once thought she would forever be barren and just when she’d thought it too late, the child had been conceived. her coming reassured me of my belovedness, my blessedness and released from me my anxiety, my striving, my fear of inadequacy and worthlessness. like autumn itself, i felt myself let go, relax…. so that the harvest might occur in its own time. almost instantly, in loosening my grip, i felt once again Love’s embrace. the whispered, ‘beloved’, which earlier in the week i had begun hearing again for the first time in a long while, now felt like a song singing in me. this was re-membered to me, this image of God i am created to be….rounded and pregnant with presence, nurturing and giving birth to something sacred here in this place. Loved and Beloved. Wise. and so i added my stone’s story to the others, each one re-membering something, gathered from where we each had been scattered, forgotten. and we carried them to the sacred space, chosen by one, neath the protection of a pine bough, and began to sing Dona Nobis Pacem (give us peace) over and over as Dennis’ hands received the offerings we’d brought, and, by the light of our flashlights there next to the dark water, constructed a cairn. there was something remarkable there in those moments. .. a holy hush within the song itself, the movement of hands as if in a choreographed dance, the lights from our flashlights casting their beams. all of us, together, with one another, through our coming together in this particular way, in this particular place and time, created a container in which the Presence of God in our midst could be known, and our attentive Love-making brought forth and made visible something more of the Presence of God than was previously known. of course, the Holy One was there all along, about us, above, below, before and behind us, within us, with or without our naming or claiming. it is we who are absent, as the poet says. it is we who are in need of remembrance. 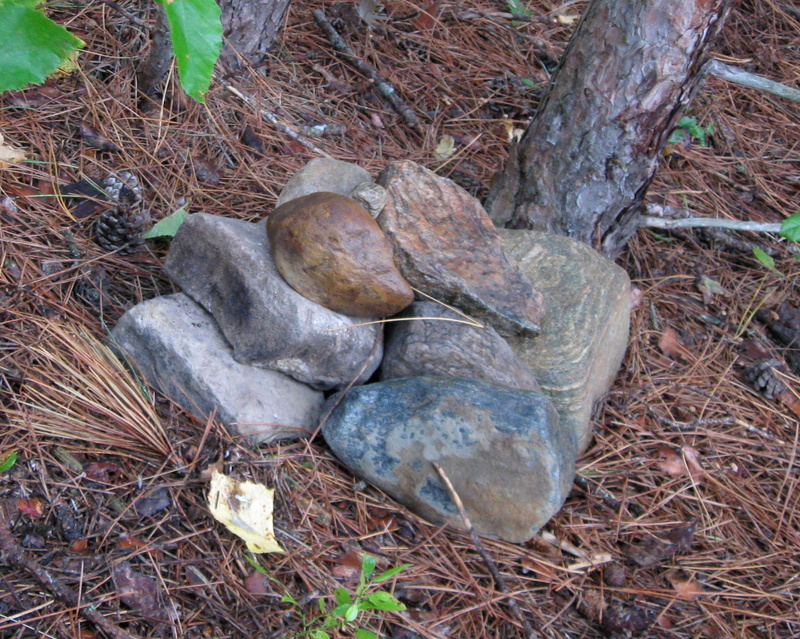 and so our little pile of stones commemorates somehow, as does the inukshuk in some instances, the ‘we were here’. not in an egotistical, conquering, laying claim to kind of way, but in a ‘we were really here’ kind of way. we were fully here. wholly here. holy here. here is where we re-membered the holy One, the holiness of the whole of life, and the holiness of ourselves within it. my rounded stone became one of the cornerstones at the base of the cairn. i like that it is near the earth as it is of the earth. it is grounded, both supported and supportive. and i think it rather ‘fitting’ that at the cornerstone of all of our becomings here in this place, there must be the knowing of the mother…that she is bearing something sacred into life.